Hailing from a family of musicians, S. MAHATHI is a child prodigy. 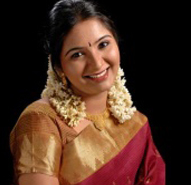 She began tosing in various Devotional albums and sang for some Malayalam movies. She introduced herself in a Tamil film, music composed by the great Isai Gnani Illayaraja with a solo song “Enna Maranthalum” in the movie “Kaadhal Jaathi”. Her smash hit “Aiyyaiyyo Pudichirukku”, a duet song with Sri. Hariharan, composed by Sri. Harris Jeyaraj in Vikram’s “Saamy” made her popular among Tamil music lovers. She bagged many awards and accolades from reputed music organizations. Mahathi began her playback singing career with Maestro Illayaraja. She recorded a solo “Enna Maranthalum” in his music direction in the movie Kaadhal Jaathi. Unfortunately, this movie did not see the light of day. Mahathi, started identifying Classical Ragas at the tender age of 1 ½ years. This talent was identified by the parents during her father’s concert at a temple in Palakad. Her parents nurtured her talent by teaching her more and more Ragas. At Trichur she began to sing in various Devotional Cassettes. She sang for some of the Malayalam movies. The year 2003, was a turning point in Mahathi’s life. On May 1st 2003, came her smash hit “Aiyyaiyyo Pudichirukku”, a duet song with Sri. Hariharan, Music Directed by Sri. Harris Jeyaraj in Vikram’s Super Hit Movie “Saamy”. Born 1985.Father Sri. Thiruvaiyar P. Sekar, a Vocalist is a disciple of Padmavibhushan Dr. M. Balamurali Krishna. Her mother Smt. Vasanthi Sekar is a Flutist, is the grand disciple of Sri. T. R. Mahalingam, Sri. N. Ramani and Smt. Kesi. She is the great granddaughter of the famous violinist “Sangeetha Kalanidhi” Pazhamaneri Swaminatha Iyer. Mahathi, started identifying Classical Ragas at the tender age of 1 ½ years. When she was 2 ½ years old she was able to identify about 75 Carnatic Ragas. In those days, just to test her talents, her father used to mix up Carnatic Swaras but Mahathi did not hesitate to identify the exact swaras of the Ragas. Mahathi underwent her initial musical training from her parents and from Deepa, Gayatri of Trivandrum. When Mahathi’s family moved to Trichur, she was put under the guidance of Sri. Mangad K. Natesan. Completing her 10th Standard, her family moved to Cochin, where she did her 11th in Sacred Heart Convent. Completing her 11th Standard, her family moved to Chennai, foreseeing her career in the Playback Singing field too. 2010: P. K. Chari Endowment Prize for the Best Concert of Gokulashtami Series of the year from Sri Krishna Gana Sabha, Chennai. 2011: Yuva Kala Bharathi title for Outstanding Achievement in the field of Carnatic Music from Bharat Kalachar, Chennai. "The Chord Wizard" title from WE (Women Exclusive) Magazine, Chennai, India.